The podcast also expresses the disenfranchisement the hosts experience in their Orthodox community because of their participation in fan culture. Orthodoxy is traditionally known for encouraging the pursuit of the sacred and using one’s fleeting existence to embody the Torah’s values. Allowing oneself to be engrossed in the alternate dimensions of Rick and Morty and Game of Thrones is trivial and, as Orthodox rabbis might mutter disapprovingly, sheer “narishkeit” (“foolishness” in Yiddish). Being overtly obsessed with fandom, then, can cause Orthodox women to feel alienated. To counter this belief, Michal asserted gently, “What often draws people to fandom is the act of being intellectually engaged and inquisitive. These are the same qualities that Judaism values.” Indeed, fervent curiosity about these fictional worlds is reminiscent of being drawn to the more provocative, mythical aspects of Jewish learning (like the giants, angels, and demons mentioned in midrash and kabbalah). On OLUF’s about page, Michal combines Orthodoxy and fandom. “Thinking about a modest cosplay? Have a random dvar Torah related to Star Wars? Then this is the group for you!,” reads the description. And on the podcast, all three women interweave their Jewish daily lives with what’s currently on their geek radar. For instance, before the High Holidays, the Nice Jewish Fangirls analyzed how bad guys, like Severus Snape from Harry Potter and Jaime Lannister from Game of Thrones, repent and are redeemed. They also question why more female characters don’t get to have the rich character arc of committing teshuvah. 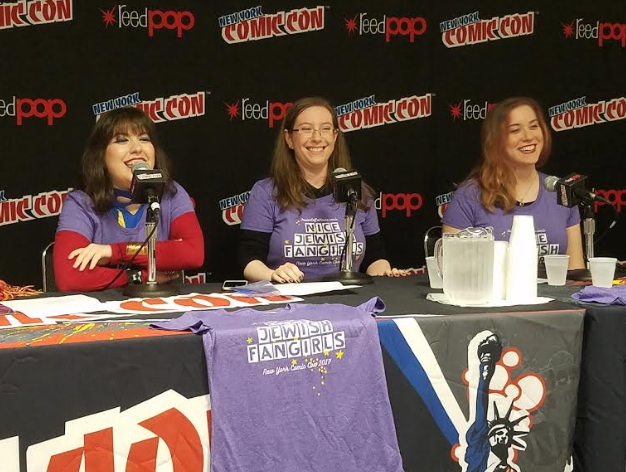 Nice Jewish Fangirls also engages listeners by bringing in kickass Jewish women to speak about their professional roles in fandom. “We’ve had Leetal Platt and Navah Wolfe come on our show. Leetal is a fashion designer who does a lot of fandom related items for Her Universe and Navah is a Hugo-nominated editor at Saga Press specializing in fantasy and sci-fi,” said Michal. “We also had my father come on!” SM chimed in. SM’s father is the author of The (Unofficial) Hogwarts Haggadah, a haggadah that creates parallels between Passover and Harry Potter. Nice Jewish Fangirls’ panel during Comic Con is worth a watch. They challenge their audience, and their audience challenges them. They speak about what it is about geekery that lights their proverbial fire. Each host is motivated by a desire to ensure that Jewishness and fandom run parallel—instead of diverging, breaking, and losing devotees. The energy behind these three women’s’ opinions about inclusion is a similar energy that belies their interest in everything ranging from Korean Pop Culture to DC Comics. Their podcast discussions are informed, thoughtful, analytical, and, sometimes, simply funny. And, most importantly, listening to them is comforting to people who have felt that larger institutions (like misogyny or Orthodoxy) inhibit them from feeling completely content within their geekiness. 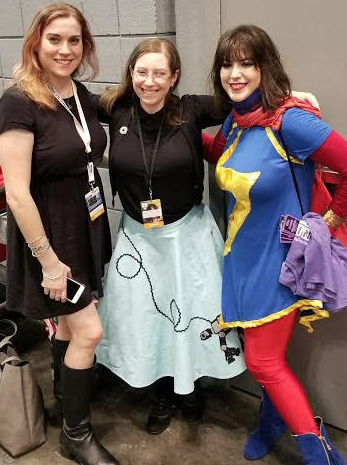 Nice Jewish Girls Fangirls is a symbol of feminism and Jewish unity, and their appearance at Comic Con is only the start. (Hear that, Mayim Bialik? Get on their podcast!) And maybe, just maybe, these women can one day inspire J.K. Rowling to write Anthony Goldstein and the Magical Menorah…or you know…any Judaic item of her choosing. Oh, well–at least the CW acknowledges that the Nazis WERE “bad guys”. Of late, some people seem a little unclear on this concept. The media could and should do a better job of showing how harmful fascism and other forms of tyranny have been to MOST members of tyrannical societies. Many who collaborated with Nazism thought it would be good for them–and they were in for a surprise. If nothing else, almost everybody misses the right to free speech when it’s gone. Hey, media: any chance for a (very-updated) revival of “It Can’t Happen Here”? Maybe a futuristic, sci-fi version?